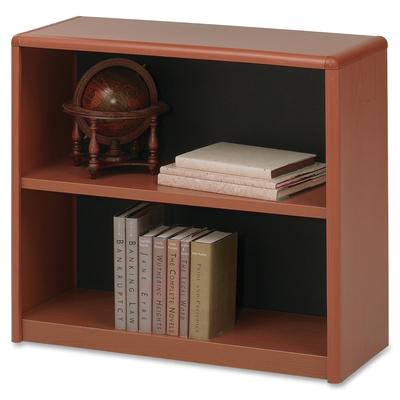 Two-Shelf Bookcase Features A Strong, 24-Gauge Steel Exterior And Shelf Construction Together With A Solid Fiberboard Back For Sturdy, Dependable Value. Plastic, Snap-In Radius Corners Along With Quick-Lock Fasteners Make Assembly Easy And Add To The Overall Strength Of The Bookcase. Generously 12" Deep Shelves Accommodate Three-Ring Binders And Oversized Materials And Adjust In 1" Increments During Assembly. Shelves Hold 70 Lb. Evenly Distributed. Steel Construction Has A Powder-Coat Finish For Extra Durability..
Two-Shelf Bookcase Features A Strong, 24-Gauge Steel Exterior And Shelf Construction Together With A Solid Fiberboard Back For Sturdy, Dependable Value. Plastic, Snap-In Radius Corners Along With Quick-Lock Fasteners Make Assembly Easy And Add To The Overall Strength Of The Bookcase. Generously 12" Deep Shelves Accommodate Three-Ring Binders And Oversized Materials And Adjust In 1" Increments During Assembly. Shelves Hold 70 Lb. Evenly Distributed. Steel Construction Has A Powder-Coat Finish For Extra Durability.